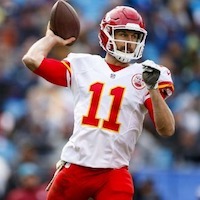 The Kansas City Chiefs (6-5) and the New York jets (4-7) square off this weekend from MetLife Stadium in an AFC matchup that proves to be crucial for the Chiefs. Kansas City is looking to stop a three-game losing streak that has left them just one game in front of the San Diego Chargers and the Oakland Raiders. The Chiefs have lost five of their last six games and will see the debut of cornerback Darelle Revis, who will be going up against his former Jets team after signing with the Chiefs on November 22. Despite their 4-7 record the Jets are a tough outing as they are a physical team on defense and are no slouch on offense as Josh McCown and Robby Anderson are becoming a lethal combination. On paper the Jets have no big threatening names, but they somehow find ways to produce big plays week in and week out. A lot of that is because McCown is making big throws and buying time with his legs to find the open receivers. Anderson has been the player that has benefitted the most in this offense as he has scored six touchdowns in the last five weeks, including last week’s performance against the Panthers in which he caught 10 passes for 146 yards and two touchdowns in a losing effort. The Jets have to feel hopeful for this match as they face a Chiefs team that is completely different to the one that started the season 5-0. Not only is Alex Smith struggling and not making big plays, but the running game has also stalled lately. Smith has not been getting the necessary support from his offensive line and running backs. Karim Hunt is not finding the open holes and failing to attack the outside of the backfield because due to the struggling offensive line defenders are getting him sooner and preventing him from making the breaks necessary to reach the open field. As a result, despite the fact that defenses are not using eight-men boxes, he no longer is a trick-play threat anymore and opponents can focus on applying pressure on Smith and covering his receivers. The front seven of the Jets is quite good and they will try to employ the same formula to force Smith to throw the ball downfield quicker and on the run, something that’s not his strength. To prevent that the Chiefs offensive line will have to find a way to leave their struggles behind. They must win the battle on the trenches so they can help their team establish the run and protect Smith with enough time so he can find his speedy receivers. If that happens expect the Chiefs to win this game on the road and avoid their sixth loss in the last seven weeks.